As most folks know I will be adding in a number of different mason bee and Native Pollinator hotels and nesting box’s here on the farm. I am also placing Nest Box’s at some community gardens as well as private garden/yards. 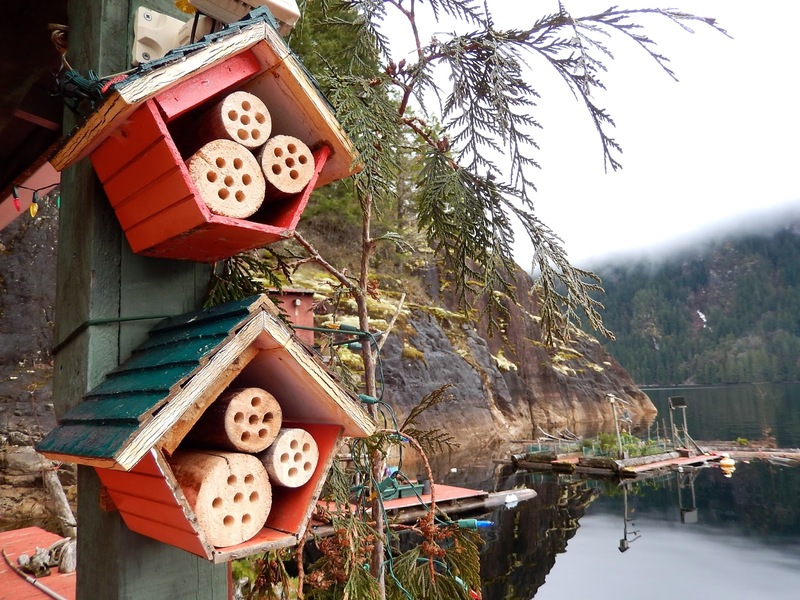 I was very excited to see a post on Powell River Books Blog talking about their Mason Bee Hotels as they are a number of years worth of working with them. I wrote and asked if they would be open to doing a guest post series here on the blog. Thank you so much for saying YES! Part Three of Three – Keeping your Mason Bee House Working. I love this upcycle idea of using a older or new bird house to create the base for your mason bee house. I have noticed that “birds houses” are a faction of the cost compared to buy a Mason bee wooden house. Frugal is always a good thing. In our area Mason Bees hatch, begin feeding and look for likely nesting sites in March. Last year’s filled nesting blocks resting under the front porch. Larvae mature during the summer and remain dormant from fall through winter. A freezing snap followed by increased sunshine and warming weather breaks their dormancy. To get ready for the hatching phase, and to provide new nesting sites, Wayne and I made new blocks. We gently moved the old ones to a location nearby so the hatchlings can easily find their new nesting blocks. Males emerge first but have to wait for females before the mating season begins. Mason Bees remain active for 4 to six weeks. While they feed and collect pollen for their nests and larvae, they are busy with the important process of plant pollination. Old nesting blocks face southeast to catch the morning sun and encourage hatching. 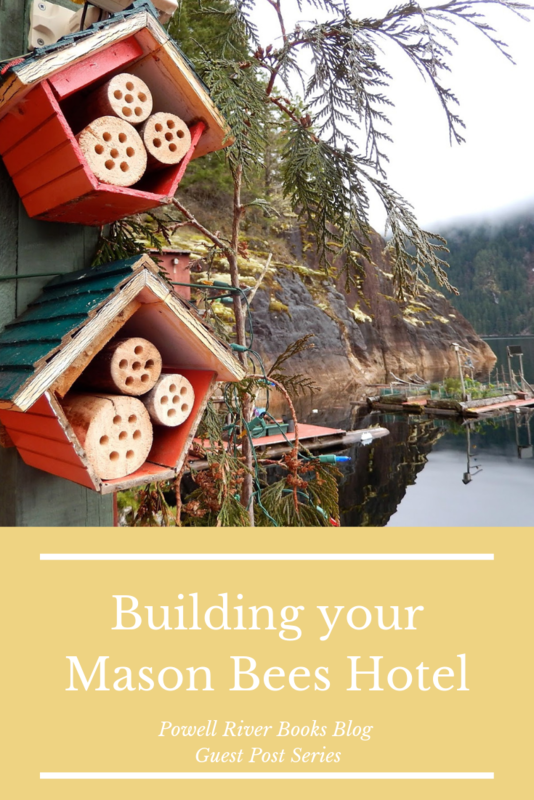 Building bee hotels is a simple process. I made mine from old birdhouses. 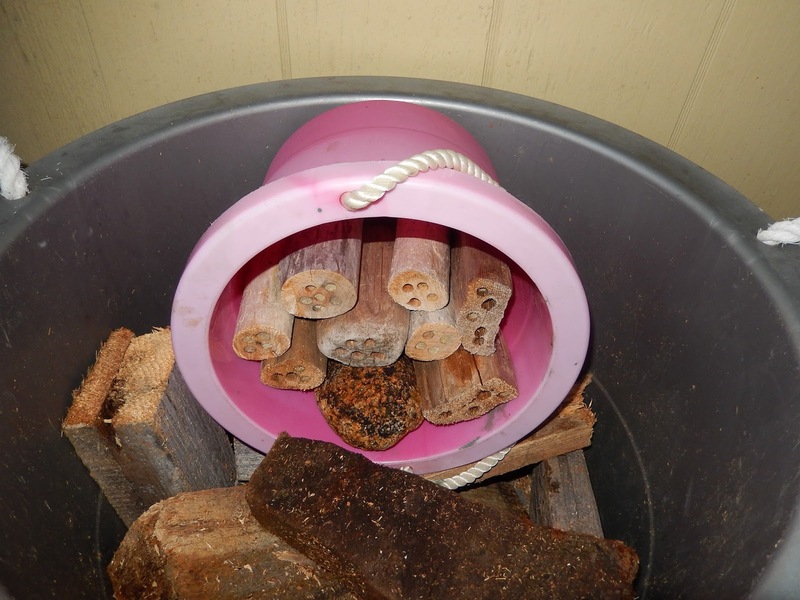 Drill nesting blocks out of untreated wood you have on hand. I use driftwood sticks. Drill 6-inch deep 5/16-inch holes with an opening only in the front. Mount your hotel above ground, where it won’t sway, facing south or southeast for plenty of sun. Drilling blocks 6″ deep encourages female production. Thank you again for sharing your posts here. 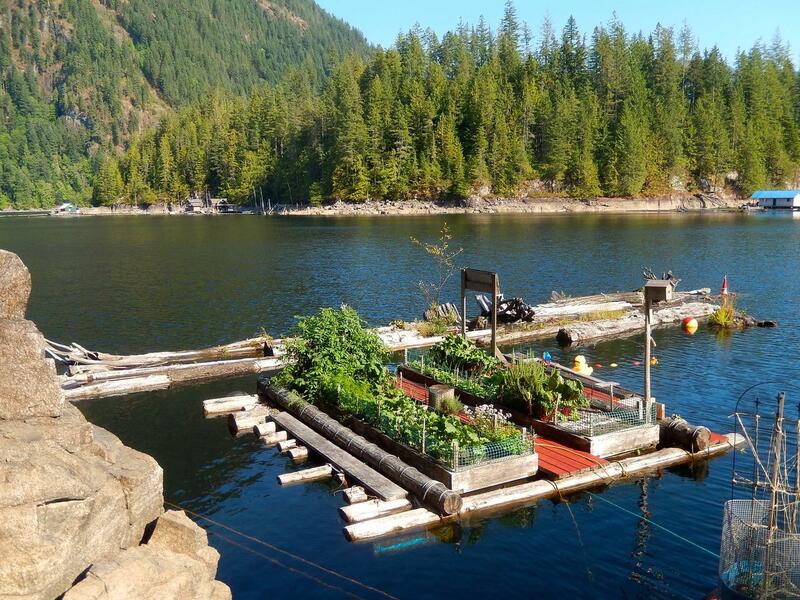 I love their floating gardens.. You truly live in a very special place! Want to learn more about their life? Join us in Coastal BC and head up Powell Lake to experience off-the-grid life in a floating cabin. Up the Lake is the first book in the Coastal BC Stories series. It tells the story about how we discovered Powell River, takes you on an ocean cruise to popular Desolation Sound, for a quad ride into the backcountry and an overhead flight for a unique view of this incredible place. Read Up the Lake by Wayne Lutz and join us for the vacation of a lifetime. Up the Lake is free for Kindle readers at Amazon and most online e-book sellers. These post’s was written between 2015 – 2018 They have a had great success with getting their mason bee’s to like their new home! Margy Lutz and her husband Wayne discovered Powell River, BC, during an airplane camping trip in 2000. 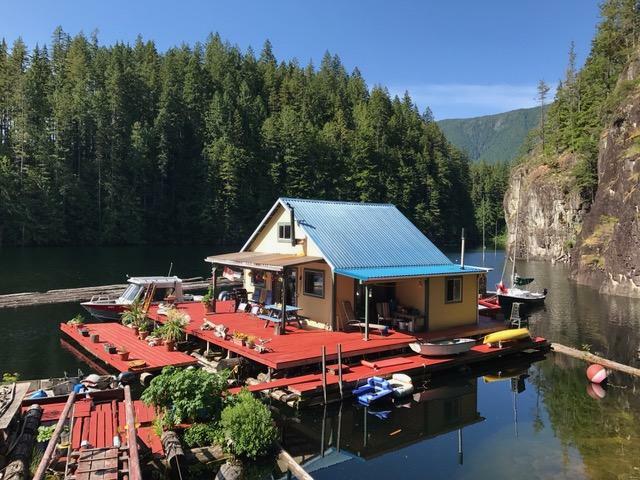 They purchased an off-the-grid float cabin on nearby Powell Lake that has become their home since retiring from careers in education in Southern California and becoming Canadian permanent residents and citizens. Margy is the author of the Powell River Books Blog and Wayne is the author of the Coastal BC Stories series of books. 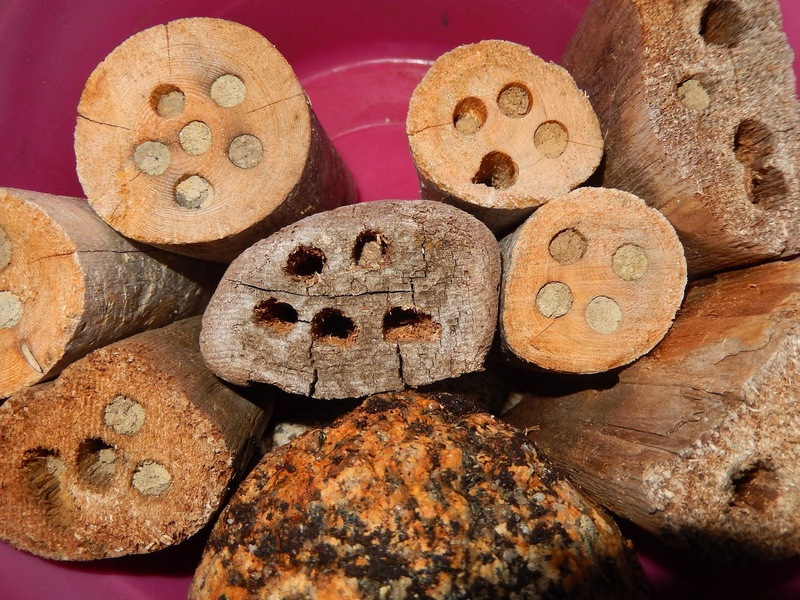 This entry was posted in Mason Bees, Native Bee's and tagged Building a Mason bee hotel, Drilling out a log for mason bees, Mason Bees, Powel River Blog. Bookmark the permalink.